Indiana Air National Guard Security Forces Operations and Training Facility « Davis & Associates, Inc. Located in Fort Wayne Indiana on the Baer Field Air Force Base, the Security Forces Operations and Training Facility houses the Indiana Air National Guard Security division along with the local branch of Homeland Security. 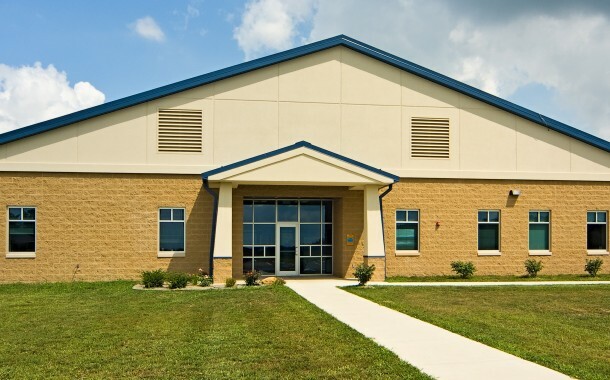 This building serves all aspects of protection and security for the base containing training and simulation classrooms, weapons storage, a fitness room and the administrative offices. Davis & Associates’ design-build team overcame budget restrictions to combine the original design of two buildings into one building achieving the required function more cost-effectively. The scope for the new 18,000 SF masonry and steel building included demolition of an existing 30,000 sf metal building, site reconstruction, stained concrete slab on grade, exterior insulation finish system, standing seam metal roofing, computer access flooring, upgraded boiler system, electrical and telecommunication system tying into the facilities existing system.